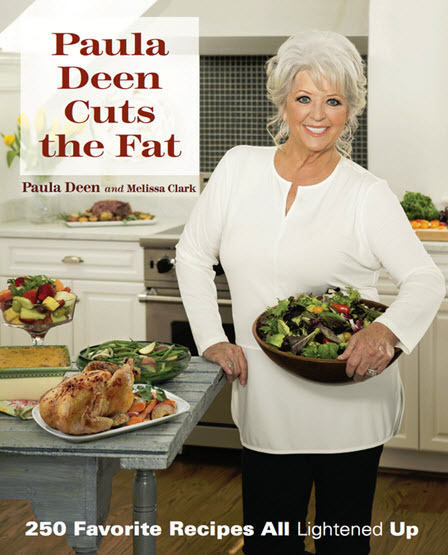 Paula Deen has released a new cookbook called Paula Deen Cuts the Fat. The book cover includes a photograph of Paula looking leaner in a white top and black pants. She holding a large bowl of salad and there is a roast chicken and more salad on the table next to her. The new book is published by Paula Deen Ventures. It contains 250 recipes that feature less butter, salt and sugar than Paula's previous recipes. Some of the recipes Paula has lightened up include Savannah Gumbo, Peach Cobbler, The Laddy's New Cheesy Mac, Beaufort Shrimp Pie and Nutty Sweet Potato Balls. The book also includes new recipes such as Crabby Shrimp Dip and Kale Caesar Salad. Paula says in a statement, "It is not about dieting – it is about living a healthier life. You can enjoy everything in moderation. It's amazing how little changes can give you big results. You don't have to lose any of the delicious tastes and flavors that we all love! This book will help you achieve your goals." Paula Deen also explains how she lost 40 pounds in the books. She is also starring on the new season of Dancing With the Stars. Paula has sold over 11 million copies of her cookbooks to date.